Rebekah Burton is from Belfast, Ireland. At a young age, music and theater was all she wanted to pursue. She studied dance, theater, and many forms of music since the first day she can remember. Her first performance was in front of approx 500 people was at age 7, when she played the piano. Rebekah plays the piano, flute, guitar, percussion, most all woodwinds, and other instruments. She has been classically trained. She came over to the United States for her furthering education, and career. She attended De Paul University, along with Goodman Theatre, where she received a Bachelor's in Music and Theater. Rebekah performed at 'Second City' while living in Chicago. She is formally from the 'Broadway' Stage and the Opera Stage. Rebekah previously performed on many 'Broadway' musicals such as "Cats", "Phantom of the Opera", "Chorus Line" and more. In total, she has performed in over 28 Total Musicals! Rebekah now performs with her band "Tribe of the Outcast". Rebekah writes most of the "Tribe's" Music. "Tribe of the Outcast" has been on Radio Stations, written in Many Newspapers/"Rag-Mag" Articles, Etc. They are an European-Indie-Rock Band. Rebekah has written some of her Music in Gaelic. Rebekah performs with the Portland Symphony a couple times a year as a soloist. She is also a soloist for the "Grotto's-Festival of Lights" at Christmas time. Rebekah has a love for children since the birth of her own child. 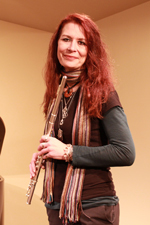 She started in the North Clackamas School system working with children in their music programs. She then helped develop an after-school program for kids to get more arts in their education, such as "Glee", "Musical Theatre", "Hip-Hop", "Acting-Drama", "Music Theory", "Music Class", etc. She has loved teaching children music and theatrical classes for many years now. It has been such a joy! Teaching music is a reward on giving back to our next musical generation! If you have a question for Rebekah, or wish to contact her, please fill out the form below. The message will be passed along to the Education Center and they will get back to you.